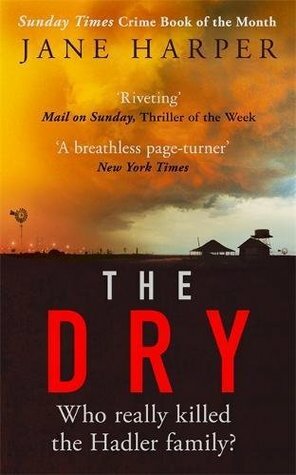 Read a full summary of The Dry by Jane Harper below. If you can’t remember what happened in The Dry and you need a refresher, then you’re in the right place. Aaron Falk returns to his hometown of Kiewarra to attend the funeral of his childhood best friend. Luke Hadler is said to have killed his family and then himself, although he spared the baby for some reason. Luke’s parents, Gerry and Barb, want Falk to look into the murder for them. They want to know for sure that their son did it. Falk is a detective, although he deals with finances rather than murders, so he’s hesitant at first but he reluctantly agrees to stay a few days to help out. Falk runs into Gretchen at the end of the funeral. She was part of Falk’s group of friends back when they were teenagers. This group consisted of Falk, Luke, Gretchen, and Ellie. Falk visits Luke’s house – the crime scene. Raco, the town’s sole detective, is already there, looking through the barn. Raco isn’t entirely certain that Luke did it. After speaking to Falk for a bit, Raco reveals that the shotgun ammunition that killed the family was different to the ammunition that Luke used. He can’t find any trace of the ammunition Luke supposedly used on the farm, which is what’s making him suspicious. Raco asks Falk to help him out with the investigation. Falk agrees to look into it. Falk is unable to tell Raco whether or not Luke was capable of doing this. Raco shows Falk the security footage from the farm. You’re able to see Luke’s truck pull up at the house and then leave shortly after, although you can’t see who’s driving it. The flashbacks start. Through these flashbacks, we meet Ellie. We learn that Falk was accused of killing her, and he and his father were driven out of town because of this. Falk was accused because a note was found written by Ellie, that “Falk” and the date that she died. We learn that Luke provided Falk with an alibi for the day that Ellie died. Falk said he was fishing alone upstream from the river that Ellie was found in, which the police found suspicious. Luke said to say that they were together shooting rabbits, but he didn’t say what he was actually doing. Raco and Falk go to speak to Jamie on his farm. Luke was allegedly with him for most of the day shooting rabbits, until he left just before the murders. Jamie lives with his grandma, who looks a bit confused when Jamie says he was at the farm all evening. Falk stays at a pub while he’s in town. Grant Deacon and his uncle (Ellie’s father) attend this pub and they’re not happy that Falk is there. There’s a slight altercation but Falk manages to dissuade them from creating a massive scene. During the flashbacks, we learn that Luke was interested in Ellie. Falk was also interested in Ellie. And Luke brought Gretchen into the group to make Ellie jealous, but she didn’t seem to care, and the girls both got on really well. Luke and Gretchen date. Falk goes to the park with Gretchen, and the other mothers tell Falk to leave. Falk and Raco go to speak to Whitlam – the headteacher at the school that Karen worked at and that Billy attended. He’s very upset about the whole thing. He says his wife invited Billy over to play the day it happened, but Karen cancelled at the last minute. Falk and Raco view the school’s security footage, which doesn’t really show anything peculiar. Raco invites Falk over for dinner. His wife is lovely, and also pregnant. We learn that Jamie wasn’t actually on his farm all day. He was actually with the town’s doctor, as they were together. This is a massive secret due to the homophobia in small towns. The pair of them will probably be charged with obstruction or something because Jamie lied to the police. Falk goes back to the Hadler house, where Barb and Gerry are clearing away all the stuff. Barb gives Falk a library book, which Falk reads one evening. A note falls out which simply says “GRANT”, and also Falk’s phone number. Falk tells Raco about this and they’re not sure what to think. At some point, Falk gives Whitlam a lift home from the pub and they put his bike in the back of the car. Falk suspects Grant Deacon and his uncle. Falk’s car is vandalised because everyone wants him to leave town again. Mr Deacon is brought in for questioning. He’s a very aggressive man, and he’s clearly dealing with dementia. He has an alibi for the day of the murder, and this is later confirmed, so he couldn’t have done it. Raco is annoyed with Falk for wrongly accusing him and being so focussed on the Deacons. We learn that Ellie and Aaron kissed back in the day. They also discovered a secret hiding spot where they could put their things. Falk discovers that has a gambling problem, and figures the rest out from there. Whitlam used a school grant to pay off part of a debt that he owed. Falk notices that the tyre marks in the back of his car are the same as the marks on the back of Luke Hadler’s truck – they’re from Whitlam’s bike. Falk and Raco call the school and ask if Whitlam is there. He is, but the secretary tells him that Falk and Raco want to speak to him, so he flees into the woods. There’s a massive manhunt and eventually Falk and Raco find Whitlam. He threatens to set the bush alight, which in the drought would cause a massive fire and destroy the town. Whitlam drops the lighter, and Falk and Raco dive at him. Both suffer from intense burns but the town is saved. We learn that Karen Hadler found out about the grant and confronted Whitlam. She wanted to give him a chance to give her another explanation, but he couldn’t. She returned home with her kids. Whitlam killed Luke and put him in the back of the truck. He then drove the truck to the Hadler house and killed Karen and Billy. He was about to kill the baby but he changed his mind at the last moment. He then took the truck a bit further away and shot Luke’s body in the face. It turns out that Whitlam had anger issues, and he had hurt people before. We also finally learn what happened to Ellie Deacon. She was killed by her abusive father when she was caught trying to leave town with a fake ID. The note she had written was a reminder of her reservation at a hotel – she had booked under the name Falk. Mr Deacon and Grant Deacon covered up the murder. In return, Grant was promised the farm.